I just recently started getting a little fed up of the current Standard environment when low and behold: some new decks showed up! Well, the card pool not being exactly huge … we’ll just called them new takes/ variants on existing archetypes. One such deck caught my eye when I saw that it Top 8’ed a local PTQ here in Montreal. I recognized the deckbuilder/player and immediately thought the deck was very interesting and obscure enough that it was worth trying out and writing about. When you think mono black devotion you’re probably thinking something along the lines of this. It’s pretty similar to the Dimir list : Devour Flesh is replaced by Far/Away and Doom Blade is more or less Dimir Charm now. The newer cards aren’t direct ports however, simply different ways of interacting with our opponents. While Whip of Erebos was sometimes an MVP in the more classic Monoblack build, it’s now fallen out of favor for more creatures (now running 4 Pack Rat) or more removal. It’s just not the beast it once was. Opponents got to know how to play around it, expect it and it was probably the worst card to draw in multiples without having a Pack Rat in play. Sure, it allowed you to ‘rebuy’ cards that your Azorius/Esper opponents countered or destroyed and perhaps reanimate a game-ending Gray Merchant of Asphodel, but things have changed. The lifelink ability is still good enough to maybe warrant it as a one-of somewhere in the 75 but just like Nykthos, it’s too ‘iffy’. The deck prefers consistency over random fancy cards. Don’t trade them off too hastily though, it’ll probably see play before long in some reanimator deck (I’m fairly sure of this being a thing). Do you not just hate this card? While Devour Flesh was a pretty good answer to this guy, Far/Away is just a touch better and more versatile. In the scenario where they have two creatures in play, one of them being Blood Baron of Vizkopa, you get to bounce the other guy back to their hand and get them to sacrifice their Blood Baron (since the card resolves from left to right). Another pretty nice move if you’re in a bind is to bounce Blood Baron back to their hand and then Thoughtseize it. It seldom comes up, but it’s nice to be aware of. This is true of any creature you absolutely want to get rid of when they just have too many things on board (Precinct Captain and two soldier tokens). On the stack, a split spell that hasn’t been fused has only that half’s characteristics and converted mana cost. The other half is treated as though it didn’t exist. This is pretty interesting information. Unless you’ve had this come up before, you probably weren’t fully aware of it. I’ve actually had to look it up myself in a local tournament. Unfortunately, the person casting the spell was not aware of how it worked and had cast both halves. Fortunately for them, it would have made it impossible for them to legally cast the spell with Fuse so they were allowed to take it back and receive a small warning (FNM REL, so no biggie). It also interacts with an opposing Soldier of the Pantheon, so be sure to remind your opponent that they won’t be gaining that 1 precious life point if you only cast one of the halves. Another interesting play is to cast both halves, the Away half on your opponent and Far on your Gray Merchant of Asphodel. It’s usually a win/win situation. If they kill your Gray Merchant in the process the Away half will still resolve because the spell had two targets. I really enjoy the fact that a card that’s basically a removal spell can now double as an extra Gray Merchant when you need to finish of your opponent, stabilize or just survive that extra turn. Dimir Charm? What does that even do? What? When did this become playable? Wasn’t this like an FNM promo a while back and nobody cared? Well, yes basically it was probably the most underplayed charm (along with Gruul Charm). Heck, even Simic Charm saw some play a while back (in Bant Hexproof decks). This thing was just unappealing until now. The main problem of monoblack decks is that their 2 cost removal varies between Doom Blade, Pharika’s Cure and Ultimate Price. None of these hit Nightveil Specter. Two of the three can kill a Pack Rat,Mutvault, Burning-Tree Emissary. One of them hits Sin Collector, Rakdos Cackler, Master of Cruelties. Think of it as Dimir’s version of Last Breath (another card that is seeing much more play). Dimir Charm deals with all of these. What about the other modes? Who doesn’t run this ? There are a few more that I’m probably missing, such as Read the Bones, Divination, Anger of the Gods, Dreadbore and Duress. They all see some play, so it’s nice to have this option too. It catches people off guard, which is nice. Obviously, this becomes less good once people become accustomed to the deck. This is something that happened to the original monoblack deck awhile back. A lot of players learned how to sideboard against it and what to play around. The lack of mass removal also made the original deck more vulnerable to an early rush of creatures. Isn’t there a third option? Glad you mentioned it, then again just pretend it’s not there. Much like Breaking/Entering‘s second half, you can just skip it. There are very few times it can come in handy (much like casting Entering from under a Shelldock Isle in a mill deck to grab their giant Eldrazi creauture in response to its triggered ability). Once of those times is when your opponent absolutely needs a specific top deck or a live draw when you are going to win the following turn. You’ll play it on them and most likely end up giving them a land. You can also play the ‘mill’ mode if they decided to Scry and keep the card on top. Note however that this is probably still not that great. Another situation would be to allow you to dig for a game-winning Gray Merchant. In conjunction with Underworld Connections, it can be like a badly assembled Sensei’s Divining Top. Not too exciting, but it’s there and I hope you never have to go there. One of the main problems of this deck is that it tends to lose games that go really really long (usually versus Azorius and Esper decks). The current Standard planeswalker, Liliana of the Dark Realms is just terrible from a competitive standpoint. Go ahead and jam her in your whatever Commander or casual deck, but at all costs: don’t try to make her ‘work’ in Standard. In comes our Dark Knight in shinning armor, sort of. I have tried various BUG builds with Ashiok in them and it never really felt that I was winning with him in play, even when I was. merged with the monoblack shell however, things become more interesting. Even if all he’s doing is something along the lines of +2 into -1 to -3 to play one of their small dudes over and over, it’s just fine. He can stem the bleeding or just completely slow down their aggro. In a monoblack ‘mirror match’ taking a ‘milled’ Nightveil Specter is downright insane. One of the cooler features of the card is that it deals with one of the more hated deck quite well. I’m talking about Azorius control. No one can actually enjoy playing against a deck that almost literally does nothing for so many turns only to win off the back of an Elspeth, infinite recurring Sphinx’s Revelations with Elixir of Immortality or a Jace ultimate (unlikely). I don’t really enjoy playing where such a deck is ‘a thing’. 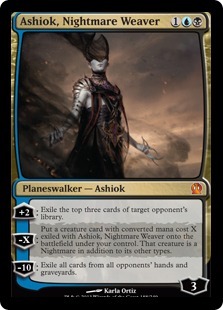 Ashiok slowly grinds these decks down with his +2, almost never activating ability # 2 and then can go ultimate barring any Mutavault hits or Detention Spheres. At that point, you should be in a good position to win since they will need to rebuild their hand or you will have milled the Elixir of Immortality and their few win conditions. Psychic Strike? Where’s the real list? You might have to go and read what the card does and that’s understandable. Normally it’s an O.K limited card when you’re playing a mill archetype in Ravnica block draft (or if you were playing Sealed in Gatecrash). The card has one very interesting feature. That’s quite an interesting mana cost, is it not? One blue mana only? Counter anything? hmm…seems legit! The mill feature is probably not relevant most of the time, but it’s basically free. We get to play a counterspell in a deck that runs a minimum number of blue sources. Eight blue sources to be exact and that’s more than enough. We only ever really need one in play most of the time. Well, you can maybe go out and test it. I know I have, with favorable results. So far it’s been 7-0-1 (only two local tourneys) and its had some match-ups that were bad for regular monoblack. If it were to become more and more popular, the deck would generate more hate towards it and likely become less effective overall. For the time being, it does not look to very popular under its UB form as most people prefer the white splash for Blood Baron and Sin Collector. I doubt the sideboard needs that much explanation, except that it has more counters specifically versus the blue deck (Gainsay). The Cyclonic Rifts seem pretty random but they can be used to bounce Detention Spheres back to our opponents’ hands. Following that, you can go ahead and Thoughtseize the Detention Sphere to get a Recoil or Vindicate-style effect. Sphinx’s Revelation for how much? It’s pretty cool to see yet another charm as an FNM promo and part of me thinks that they will go ahead and make all 10 into FNM promos. This would probably be a move that almost everyone would be happy with. A lot of the charm effects are pretty cool and I for one play the Boros Charm in my EDH deck paired with an Obliterate. It almost never happens, but it’s pretty awesome when it does. Remember to go play FNM at your local game store. At a Magic: the Gathering store near you! This is obviously a very control-oriented charm as its Dimir colors imply. You can destroy a little guy like Dark Confidant in Modern, counter something like Scapeshift or maybe mess up a Bloodbraid Elf cascade (well, maybe not). It might end up being a two-of in a future Standard Esper control deck. There will probably be quite a few powerful sorceries in Type 2 and let’s not forget all the ‘Miracles’ cards are Sorceries as well. So it’s like the ‘Despair Charm’ countering all the hope/miracles. The ‘mill’ part is so conditional I would almost never recommend it except maybe in draft to give your opponent a dead draw or to instant speed ‘Index‘ yourself when you really need something good.